THE RECOMMENDATION: There really isn’t a lot going on in this first entry to the Fast & Furious franchise. I knew it would be completely different from the more recent ones I’ve seen, but in this case different doesn’t equal better. For any car or racing aficionados, I’m sure The Fast and the Furious is right up your wheelhouse and will provide lots of entertainment and adrenaline rushes to satiate your hunger for nitrous oxide fueled ragers. But for someone who only occasionally plays racing games (primarily Mario Kart) and knows nothing about street racing, The Fast and the Furious seemed quite foreign to me. And besides the street racing elements, there really isn’t a whole lot else going on. 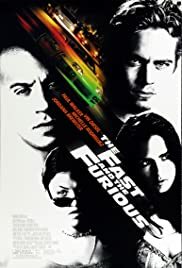 Sure, there is a love story between Brian O’Connor (Paul Walker) and Mia Toretto (Jordana Brewster) and there’s also a heist element that involves robbing trucks (while moving) on the highway, but they seem like forced additions so it wasn’t just a film with weird time warp and blur effects as race cars blaze at 140 mph down city streets in the dead of night. Only recommended for the craziest gear heads.